BioJoe & Beth's Favorite Fact. According to data from the Factbook, biodiesel production in the U.S. is on an upward trend having grown 25% from 2015 to 2017 and reaching peak production in 2016 of two billion gallons. In 2007, as gas prices were passing $4 a gallon, Joe and Beth Renwick were looking to cut costs in their family budget. They decided to experiment with making their own fuel in their garage, working with bio-based products. What they found was that everyone else’s trash was their treasure. 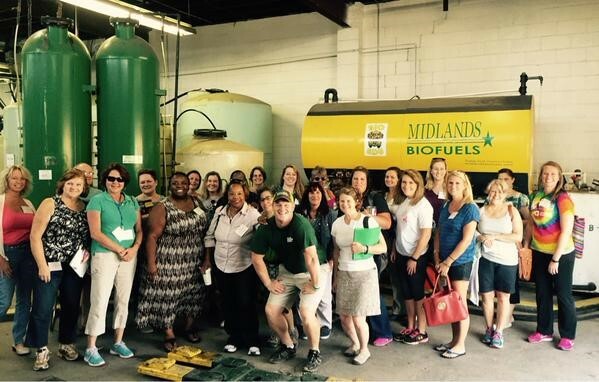 Waste vegetable oils that schools and restaurants often discard could be cleaned and recycled into biodiesel fuel, which could then be used to heat a building or run a car engine. 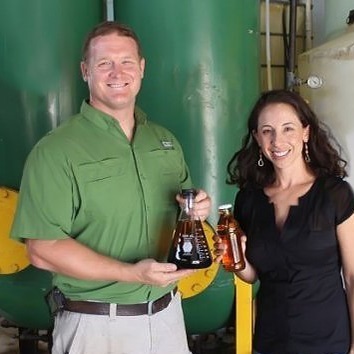 Soon, the Renwicks found themselves launching a biofuel business that would extend the economic benefits of biofuel from their family, to the local community, and on to the greater Southeast region. Founded in 2008 as Midlands Energy, the company quickly spread its reach beyond South Carolina into multiple states in the region. In 2017 the Renwicks renamed their firm Green Energy Biofuel to reflect both its commitment to providing clean energy and the geographic expansion of the company. The firm has secured major corporate customers with a high volume of product, and as a result, has invested in significant plant modifications to increase the efficiency of processing the oil received from customers. The “fearless leader” of Green Energy Biofuel is Joe Renwick, who goes by the moniker “BioJoe” and harkens his leadership skills to lessons learned in The Citadel, one of the toughest military academies in the U.S.
Green Energy Biofuel provides two key services to food industry establishments: cooking oil collection and grease trap pumping. The company maintains a fleet of trucks that criss-crosses the Southeast to collect waste cooking oil that is loaded into tanks. However, not every establishment has the best infrastructure to facilitate grease collection, so Green Energy Biofuel also installs grease traps in these kitchens. One advantage for the restaurants is that the grease traps pay for themselves, as restaurant owners sell waste oil to Green Energy Biofuel for $0.50 per gallon. On the receiving end of the finished biofuel, the company works to make its product as accessible as possible to any vehicle. Green Energy Biofuel no longer makes its own biodiesel; however, the firm sells its purified biofuel to a large biodiesel manufacturer, which then produces the fuel on a much larger scale. BioJoe and Beth’s trucks run on South Carolina biodiesel, but most engines would require modification to accept 100% biofuel. Instead, many engines can accept a mixture of 20% biodiesel and 80% regular diesel as a drop-in fuel. This mixture burns more efficiently than petroleum diesel, lubricates the engine, cleans out engine particulates, and emits less pollutants than petroleum diesel. Not to be overlooked, the exhaust also smells like french fries, which is a nice improvement from the odor of petroleum diesel. Another tangible benefit of Green Energy Biofuel, BioJoe and Beth pay their success forward by giving schools, colleges, and small businesses back a percentage of profits from collections.They also provide opportunities for children to tour the production facility and learn how biofuels are made. “As long as we are ‘Making Fuel Baby,’ we will always be a proud supporter of education,” says BioJoe. Green Energy Biofuel, which showcases business materials alongside quirky photos of the staff and family events on its website, isn’t just producing biofuel. In addition to fueling trucks in the Southeast from its collection stream, Green Energy Biofuel is producing sustainable jobs, bolstering business bottom lines, and enhancing local communities; all this from a restaurant grease trap.